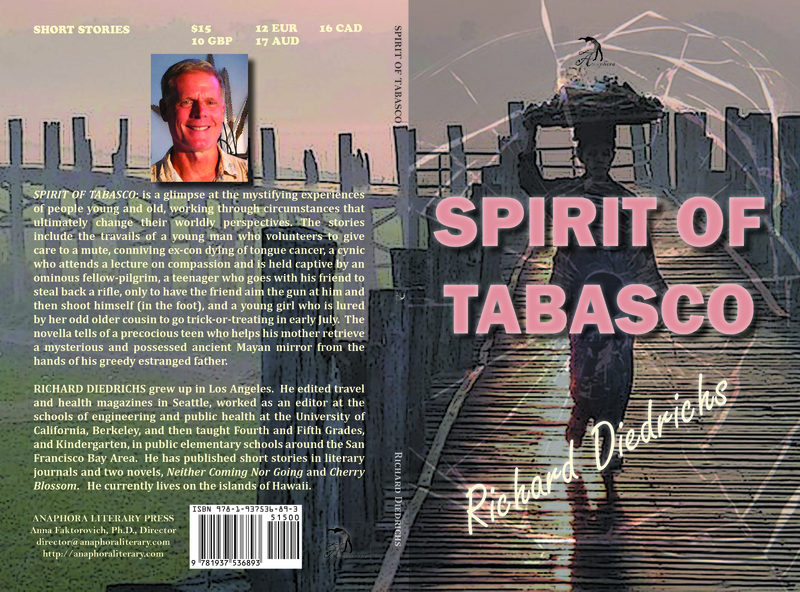 Spirit of Tabasco: ($15, ISBN: 978-1-937536-89-3, Hardcover ISBN: 978-1-68114-126-8, LCCN: 2014951609, 110pp, 6X9″, October 2014; Buy on Amazon or Barnes & Noble): is a glimpse at the mystifying experiences of people young and old, working through circumstances that ultimately change their worldly perspectives. The stories include the travails of a young man who volunteers to give care to a mute, conniving ex-con dying of tongue cancer, a cynic who attends a lecture on compassion and is held captive by an ominous fellow-pilgrim, a teenager who goes with his friend to steal back a rifle, only to have the friend aim the gun at him and then shoot himself (in the foot), and a young girl who is lured by her odd older cousin to go trick-or-treating in early July. The novella tells of a precocious teen who helps his mother retrieve a mysterious and possessed ancient Mayan mirror from the hands of his greedy estranged father. Richard Diedrichs grew up in Los Angeles. He edited travel and health magazines in Seattle, worked as an editor at the schools of engineering and public health at the University of California, Berkeley, and then taught Fourth and Fifth Grades, and Kindergarten, in public elementary schools around the San Francisco Bay Area. He has published short stories in literary journals and two novels, Neither Coming Nor Going and Cherry Blossom. He currently lives on the island of Hawaii.